When applied effectively Facilities Management delivers enterprise-wide benefits which go far beyond the physical and financial assets by creating a workplace and environment which improve productivity, protect employees, consumers, visitors and neighbors; provide a sound platform for an organization’s primary activities, and create long-term sustainable activity. Facilities Management is the fundamental link which enables physical assets to be used to create desired organisational outcomes. 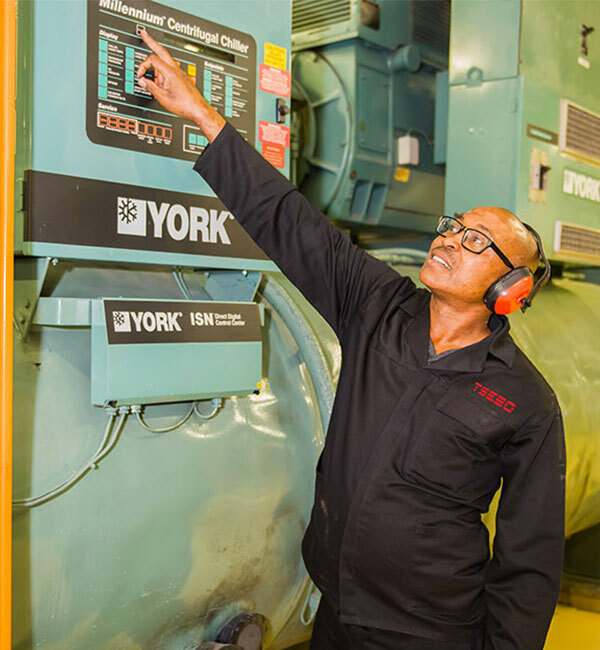 With Tsebo as their partners in Facilities Services, our clients enjoy faster growth in their African core business. This is complemented by numerous other tangible benefits. Facilities Management’s impact on the Customer and their workplace is a complex issue. Each value proposition needs to be carefully crafted and is unique to each Customer. The complexity is a result of the vast array of assets and services coupled with the uniqueness of each workplace. To compound the issue, we also need to consider the people that occupy the space, the intricacy of different company cultures as well as their organisational strategies and objectives. With Tsebo managing your infrastructure you will benefit from improved workplace and staff productivity thus improving your competitive advantage. Our experience, expertise, scale and self-delivery capabilities means better control and cost efficiencies. Our extensive continental leverage allows us to negotiate preferential rates with our supply chain partners. Your non-core operations are our core business. Tsebo’s scale and rigourous ISO compliance capability means we are able to accept greater degrees of risk transfer. Tsebo’s approach lowers complexity in your business by integrating all non-core disciplines, minimising operational duplication, improving efficiencies and allowing you to concentrate on your core business. Outsourcing is a business-related decision and one that can be challenging for an organisation to embark on. Decisions on how to outsource are not simple and should be organization specific. 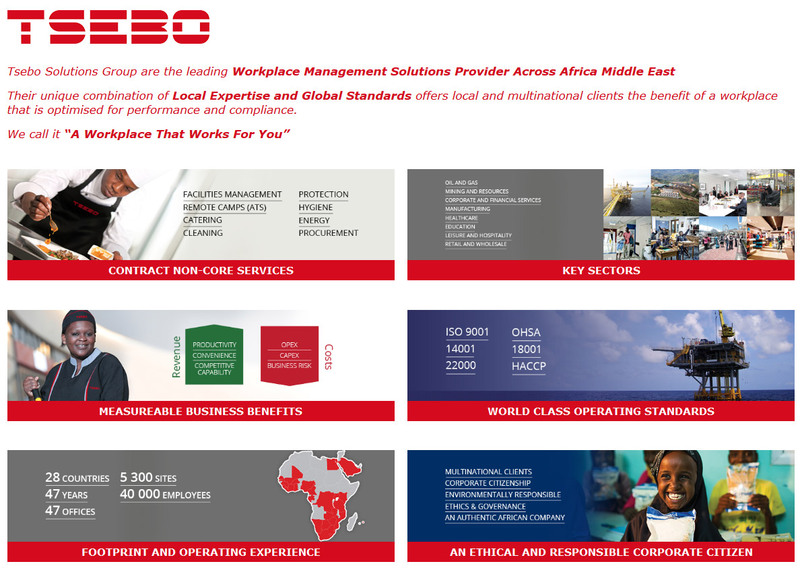 There are a huge number of factors to consider and Tsebo has unmatched experience in guiding Clients through the outsourcing process to achieve your strategic objectives. Outsourcing is not just about cost saving. Whilst no one wants to outsource the Facilities Management for it to cost more, there are numerous other reasons to suggest that outsourcing is also a strategy to achieve. Outsourcing is about driving processes out of the Client enterprise entirely to reduce overhead, variable costs, and optimise future investment. Depending on the level of centralisation that has been undertaken by the Client, Tsebo will need to continue on this path until there is a clear and unadulterated transparency of the extent and complexity of the services and cost. Outsourcing will free the Client from the cost of all work entailed in managing the non-core workers involved. The cost of HR, IT, compliance and accounts processing incur indirect costs which need to be borne by the Client until they are outsourced. Until the process is completely off the Client’s books, management must continually balance the interests of the non-core teams with those of core. Outsourcing frees everyone’s calendar and cheque book to focus on core business. The panoramic nature of Facilities Management and the services that are included under this heading cut across all departments and disciplines within an organisation. Typically, budgets are held by the individual divisions or even departments and oversight of the total direct and indirect FM spend is almost impossible until this has been centralised. The build-up of non-core activities and consequent costs goes largely unnoticed in an organisation that is growing quickly. A lack of appreciation for the magnitude of the costs involved and the potential savings on offer can lead to a lack of focus by management. In addition, shareholders want management to pay attention to core business and consequently Clients are often not prepared or able to go through the internal angst and change management that is required to centralise these operations prior to outsourcing. Tsebo’s expertise should be used, to examine all the processes and services to determine whether this is Core or Context and where the desired outcome has shifted from differentiation to productivity. Once this has been determined the first opportunity to extract cost and inefficiency comes from centralisation. This eliminates the management overhead of maintaining multiple instances of the same process in multiple schools or divisions. Outsourcing is moving to a far more co-collaborative approach and as such this paves the way for an outsourcing that has a much better chance of sustainable long-term success. The centralisation and outsourcing of what has sometimes been long-held budgets and services can be difficult. A close collaboration and change management process is required to loosen the hold of vested interests with the internal process maintainers. Centralisation breaks the link between that obligation and frees management to be much more frugal in its subsequent commitments. Having undergone centralisation and outsourcing, we are now in a situation where all similar processes are now under a single point of control. The next resource extraction opportunity is to migrate from multiple instances of the process to a single instance. Such standardisation further reduces the resource consumption, since each process step need not be replicated or reproduced. At the same time, reducing differentiation also reduces risk. The less the variability in any system the less chance of failure and the fewer resources are required to manage it. This is a cornerstone of radical productivity. To make further progress each of the process models under outsourced management is deconstructed in order that it can be further optimised. This is the role of the fourth lever in our sequence. Modularisation will consist of deconstructing a process into its component elements so that it can be re-engineered for gains in productivity. This typically requires specialised outsourced support as it involves exercising a bifocal vision. One eye looks at the process as it is currently being executed. The other eye looks at a library of templates that come from FM best practices. Tsebo will undertake this using their experience and track record in turning their Client’s non-core operations into their Core business. The goal of the modularisation effort is to come up with the simplest representation of the process that meets the input and output criteria for quality results. Such simplification alone can reduce risk and free up valuable resources. Once a process has been the modularised, it will then be optimised. During this phase, redundant and superfluous tasks can simply be eliminated. Others can be automated, and many streamlined. All outputs are fine-tuned to appropriate levels so that over-servicing does not waste further resources. All this simplifies the management and execution of the work, reducing complexity and risk, allowing us to substitute less expensive resources and free up our most experienced people. This is the penultimate lever in the Tsebo armoury as an outsourced provider, but it is the final process in the optimisation of an individual Client portfolio. Our teams Instrumentalise the process with monitor-and-control systems to manage our performance and to further reduce variation, extract risk and maintain control. As an outsourced provider in the facilities management industry scale is critical to run a sustainable and profitable business. Industrialisation is the ability of an outsourced provider to achieve economies of scale in our operations where we are able to amortise all our investments in the above levers across multiple Client engagements, thereby giving a better overall return on capital employed (ROCE).